This topic was automatically created to discuss the news story Tornado Surf Fest - nov 16 - Utrecht, NL. Need one more band to make it a festival. That's why it's called fest, not festival! Plus it is cheaper, only need 50% of the letters! What's the best way to contact someone for questions about tickets, etc? Someone contacted me because they had problems buying tickets and I didn't know who to send them to. Arny? Sure. Arny will know who to contact. 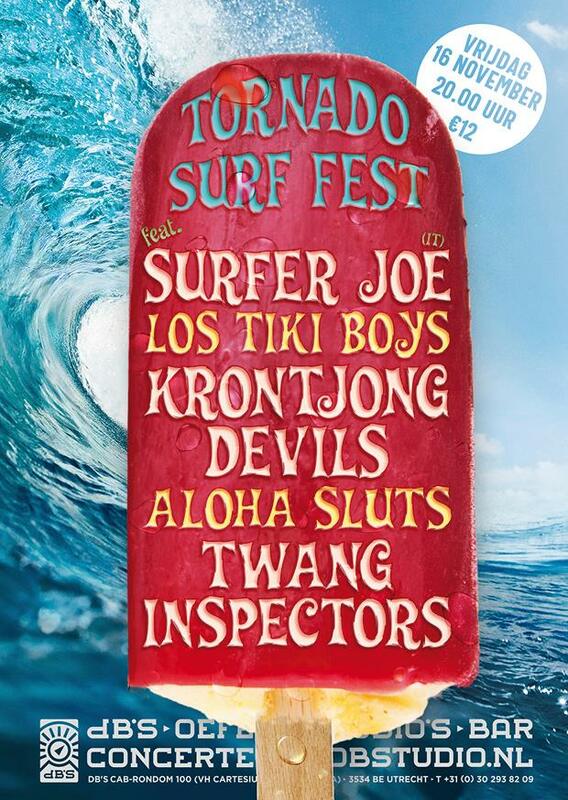 I wanna see the tornardo surf festival, i ve tried to buy the tickets, but there is an error...i didnt buy. do you think wiil have available tickets to buy at the same day? The ticket sales site is limited in time. If you don't complete your order within 15 minutes you're rejected. I'd be happy to help out if you put me into contact with the person. I'm not the organizer, but play in one of the participating bands. That was a great surf fest! Attendance about 60 people. Twang Inspectors and Los Tiki Boys were new to me. Of all bands I enjoyed Los Tiki Boys the most, not really surf but more instrumental psychedelia and fuzz. And the full and clear sound of the Aloha Sluts is incredible, all three band members have a fierce stage appearance (and wireless Arny also offstage in the audience). Unfortunately I had to leave during the last act (Surfer Joe) to catch the last train home.